Any returned packages without the RMA number on the outside of the box will not be accepted. All refunds and exchanges will be processed in accordance with the return policies posted on our website. You may request the following optional services for an additional fee. Please include payment with your RMA form in the form of a check or money order for the amount corresponding to the service selected. DO NOT SHIP via Fedex, UPS, DHL, et al. since they do not insure watches or jewelry. Shipments to other addresses will be refused. Please call us to obtain an RMA number. We are not responsible for any items left with us for over one year. For repairs, please do not ship the watch box or pillow, as we cannot guarantee the return of any packaging. All prepaid services will be completed prior to diagnostics. Repairs will take a minimum of 4 weeks. Returns will be processed within 3-5 business days from the date that a package has been delivered, and a refund may take an additional 2-3 business days to be posted back to the original payment method provided. For security reasons, DO NOT use the same brown shipping box which the item was initially sent in. For repairs and/or exchanges, please include a $30 ($32.18 for California residents) check or money order payable to AuthenticWatches.com for return shipping and handling to US addresses, or $50 for international addresses per watch. Please write RMA # on payment. Inbound international shipments must be declared as "American Goods being Returned to Shipper. HTS code 9801.00.1012." I agree that any disputes will be resolved by binding arbitration. 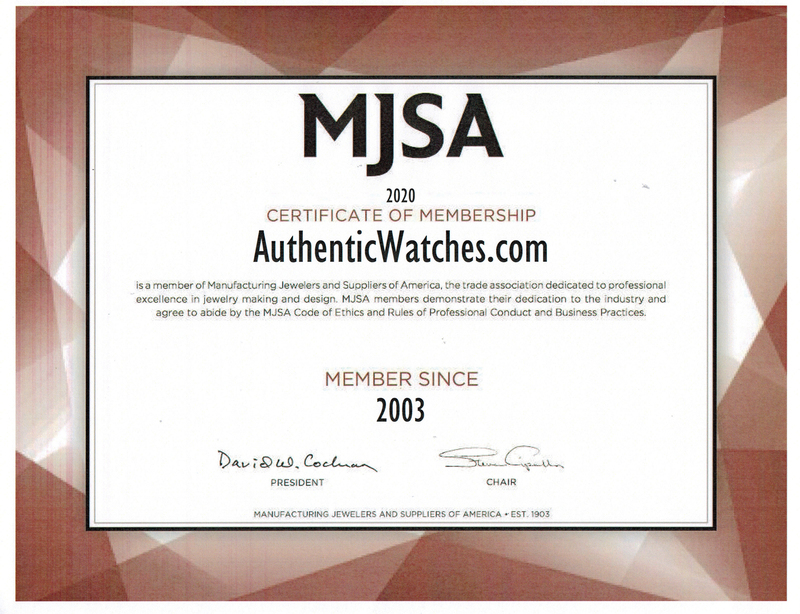 I have read, understood, and will abide by the policies set forth at http://www.authenticwatches.com/info.html. This form will not be accepted with any alterations.